Harold Morrison, a native of the Ozark Mountains of Missouri, began entertaining at an early age and was featured on local Springfield radio stations, becoming a professsional trouper of the old school and a musician skilled in the five-string banjo, dobro and lap steel. A move to the Dakotas brought exposure to his talent. Another move, this time to West Virginia, put Harold as a regular on the original radio-broadcast Jamboree in Wheeling. Home beckoned and Harold was sought by producer "Si" Siman to work as a regular on the ABC-TV show, the Ozark Jubilee, hosted by the late Red Foley. This production was seen coast-to-coast. It originated in Springfield, Missouri. Harold’s accomplishments were many. He appeared as a regular with the Wilburn Brothers on their syndicated TV show for more than seven years. With family now living in Nashville, he traveled with the George Jones / Tammy Wynette Show throughout the nation for eight more years. In contrast to his stage style, Harold Morrison was somewhat shy and extremely modest. His ringing five string banjo and hill-country foot stomping ballads were as well-received in London's Palladium, Las Vegas' Landmark, or New York City's Philharmonic Hall as they were at numerous state fairs and the Grand Ole Opry. A continual source of pride to Harold and his family was his work with the top female vocalists during the height of their careers: Miss Kitty Wells, Loretta Lynn and Tammy Wynette. Eventually, home’s song sounded sweetest and Harold returned with Eva, wife of 42 years, to the hills that gave him life and his music heart. Still performing, Harold passed from our presence suddenly in 1993. One statement can be made with conviction: Harold Morrison has been there and done that. The definitive difference is... Harold did it with flair and style. plate 1. 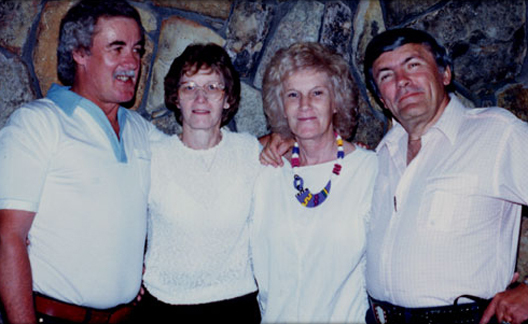 From left to right, Art and Erma Haage, Eva Mae and Harold in front of the Plummer Family Show (1987). 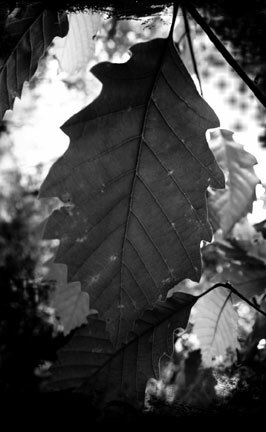 Photo credit Jamie Haage. plate 2. Harold Morrison playing on the Wilburn Brothers Show in the mid-1960s. plate 3. 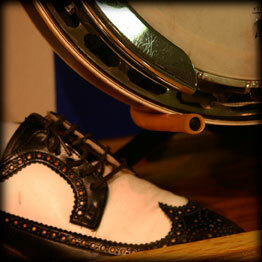 Harold Morrison’s trademark black and white shoes, and banjo, on display. plate 4. 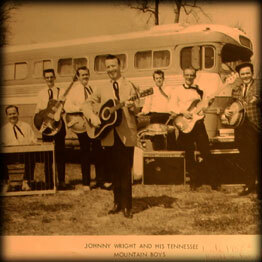 Johnny Wright & His Tennessee Mountain Boys (late 1950s); Harold is on the far right. The staff of College of the Ozarks' Ralph Foster Museum has graciously allowed the reprint of these articles from their archive. (Galena, MO) Twenty-one year old Daniel Farnum, bass player and lead vocalist with the Farnum Family, grew up in the midst of authentic Ozarks music. “I have been playing bass for close to 11 years,” relates the young man with a maturity belying his years. As lead vocalist, Daniel is an integral part of the Farnum Family band, a familiar group known for its musical legacy and traditional Ozark sound. 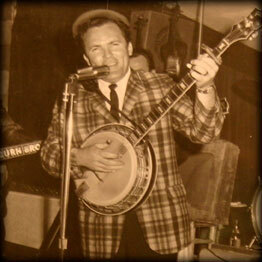 Dad Norm, with a 5-string Gibson Mastertone banjo, began playing at Silver Dollar City in 1977. “I have not had formal training but grew up in the band. I’ve been singing since I was five,” explains Daniel. When not singing and playing his Palatino travel bass, Daniel works on his own leather craftsmanship business (Action Craft Manufacturing. FOR contact information go to Links Page. For all news articles listed, visit the News Directory. 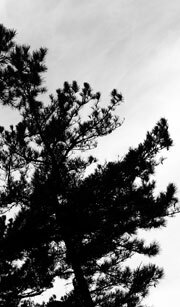 Copy and/or use of any portion of this site for commercial reasons without written consent is expressly prohibited.